His Holiness the 14th the Dalai Lama, Tenzin Gyatso, is the head of state and spiritual leader of the Tibetan people. He was born Lhamo Dhondrub on 6 July 1935, in a small village called Taktser in northeastern Tibet. Born to a peasant family, His Holiness was recognized at the age of two, in accordance with Tibetan tradition, as the reincarnation of his predecessor the 13th Dalai Lama, and thus an incarnation Avalokitesvara, the Buddha of Compassion. Lama Zopa Rinpoche was born in 1946 in Thami, in the Mount Everest region of Nepal, not far from the Lawudo cave where his predecessor had meditated for the last 20 years of his life. Lama Zopa Rinpoche is now the Spiritual Director of the Foundation for the Preservation of the Mahayana Tradition and oversees all of its activities. Geshe Tashi was born in Purang, Tibet in 1958, and with his parents he escaped to India in 1959. He entered Sera Mey Monastic University in South India when he was 13 years old, and graduated with a Lharampa (the highest possible level) Geshe degree 16 years later. Geshe Tashi then entered the Higher Tantric College (Gyuto) for a year of study. Ven. Robina Courtin is a powerful and very interesting teacher, having been an international activist for most of her life. Australian born, Robina was ordained as a nun in the late 1970's and has worked as Editorial Director of Wisdom Publications, Editor of Mandala magazine; and Director of Liberation Prison Project. Ven. Robina has brought inspiration to thousands of people around the world - from inmates in prisons to scientists at International Google Conferences. Renowned for her work with people in prisons, including those on death row, Robina's life and work is the subject of the award-winning film "Chasing Buddha". Robina has a wonderful, direct, clear, warm and at times and extremely funny teaching style. Amy J. Miller (Ven. Lobsang Chodren) first encountered Tibetan Buddhism in the spring of 1987 during a course at Kopan Monastery in Nepal. Since then, she has spent a great deal of time engaged in meditation retreats, study, teaching, and Buddhist center management throughout the world. Ven. Amy was ordained as a Buddhist nun in June 2000 by the great Tibetan master, Ven. Choden Rinpoche, and has been teaching extensively since 1992. 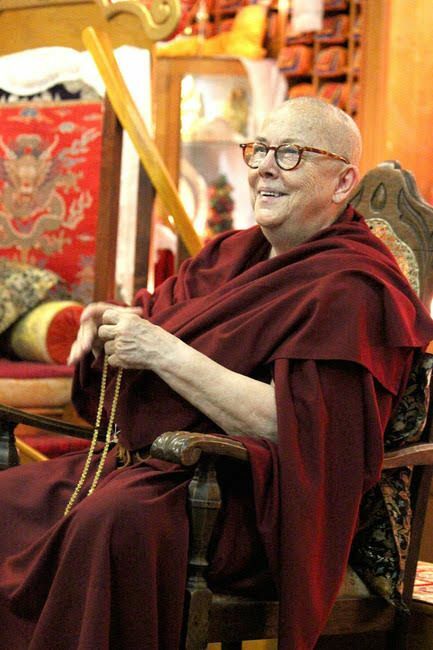 Her teaching style emphasizes a practical approach to integrating Buddhist philosophy into everyday life. Ven. Amy is happy to help people connect with meditation and mindfulness in an effort to gain a refreshing perspective on normally stressful living. She has an emphasis on courses focused on death and dying, overcoming anxiety and depression, battling addiction, and dealing with self-esteem issues. Led by a love of adventure and trekking, Mary Reavey was a staff nurse when she first encountered Buddhism at Kopan Monastery in Nepal in 1978. Mary attended a month long course taught by Lama Thubten Yeshe and Lama Zopa Rinpoche who emphasised the importance of meditation and taking complete responsibility for your own actions and their effects. Over the years Ven Mary has undertaken and led many meditation retreats. She completed a one-year solitary retreat in 2014 and another three-month retreat in 2015. She continues to regularly teach at Jamyang Buddhist Centre Leeds, Jamyang Liverpool and in York. Ven Mary has recently moved to Jedburgh in order to live nearer to Land of Joy Retreat Centre where she regularly leads retreats. Ven. Mary has lead a day meditation retreat at Jamyang Liverpool and regularly teaches Discovering Buddhism classes. Don Handrick was a 38-year-old accountant in San Francisco when he felt the first urges of a premature mid-life crisis in 1996. Ondy Willson is an FPMT touring teacher and has taught internationally including India, Moscow, Amsterdam and Latvia...and Liverpool ! We are grateful that Ondy was the first FPMT visiting teacher in Liverpool in Summer 2012, teaching from across the Discovering Buddhism modules. With a teaching style combining head, heart and humour, Ondy places the emphasis on making buddhism relevant for contemporary life.